SPING LAKE, MI (WHTC) – International Aid in Spring Lake has been responding to the needs of those around the world for 35 years. Nearly one-point-four million people need food in Nepal following last weekend’s 7.8 magnitude earthquake. Tim Lopez, Communication and Marketing Manager of International Aid says they are working with other organizations to determine the needs so that may best respond. A cash donation is what is needed now so that they can determine what is needed and get that to the people of Nepal as soon as possible. They are working with partners to access the situation so that we can send the most appropriate and needed materials Lopez states. To donate call their donation kline at 1-800-251-2502.
International Aid is seeking help from the community to provide relief supplies to the people in Nepal following the destruction caused by last week’s earthquake. 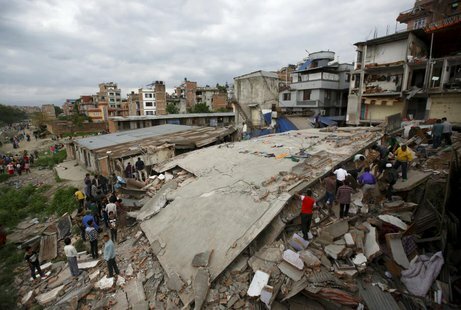 The death toll from a 7.8-magnitude earthquake that struck Nepal on Saturday rose to thousands of people in four countries by Sunday, a number that is likely to continue to rise in the coming days, officials said. Nearly two dozen aftershocks followed. Hospitals were overflowing with injured people, homes were damaged, phone lines were jammed and roads had gaping cracks running along them. “We are asking the people of this community to come alongside International Aid and help the people of Nepal who have been devastated by this massive earthquake,” IA spokesman Tim Lopez said. “At this time, we are asking the community to make monetary donations so that we can help out in the best way possible. Monetary donations can be made online at www.internationalaid.org and clicking the “Donate Now” icon. Donations may also be dropped off at International Aid, 17011 Hickory St., Spring Lake, MI 49456; or by mail to the same address. Donations can also be made over the phone at 800-251-2502. SPRING LAKE, MI (WTVB) – Help for those affected by the massive earthquake in the Himalayans is pouring in from around the globe and across West Michigan. International Aid is seeking help from the community to provide relief supplies to the people of Nepal. Nearly 1.4 million people need food in Nepal following last weekend’s 7.8 magnitude earthquake. Tim Lopez, Communication and Marketing Manager of International Aid in Spring Lake says they are working with other organizations to determine the needs so that they may best respond. Lopez says cash is the best way to respond right now. SPRING LAKE, MI – International Aid, the Christian global relief ministry based in Spring Lake, is asking residents in West Michigan and beyond to help assist survivors of the recent 7.8-magnitude earthquake in Nepal. The earthquake struck the landlocked, south Asian nation on Saturday, killing an estimated 4,400 people, according to the Associated Press. The disaster led to a 6.6 aftershock, along with several thousand injuries, separated families, severe property and infrastructure damage and overflowing hospitals. The United Nations said Tuesday that 8 million people have been affected, with about 1/4 of that number located in the 11 most devastated districts. International Aid spokesman Tim Lopez said the organization will use donated funds to provide relief supplies to Nepal citizens. Supplies historically have included life-saving medicines, hygiene products, nutritional supplements and reconditioned medical equipment, he said. The nonprofit ministry in March sought local donations to assist Cyclone Pam survivors, while last year, the agency asked for donations to help Filipinos affected by Typhoon Haiyan. Lopez said the International Aid is still responding to those nations. This week, the agency will be sending another shipment to The Philippines, he said. “The needs in disaster situations are urgent and ongoing,” Lopez said. International Aid is just one of many groups offering help to Nepal. Catholic Relief Services, Save the Children, the American Red Cross, Friends Service Council Nepal and Unicef are among the other agencies providing assistance. Residents can donate online by calling 1-800-251-2502, visiting www.internationalaid.org or by dropping off money at the International Aid office, 17011 Hickory St., Spring Lake, MI 49456. Nicole and Andrew Orr are organized, deliberate people. Their decision to leave their suburban Columbus, Ohio, home of 15 years for Holland puzzled friends and family. Andrew didn’t have a job in Holland and the Orrs had no family here. They’d visited Holland once for just over 50 hours, mostly to see the beach. Leaving great friends, a wonderful church and a happy life didn’t make sense, except to the Orrs. In March, the couple put their newly renovated modern home on the market and sold it in just 11 days. They talked to their boys, Jayden, 11, Jenson, 10, and Jace, 5, about a new life in Michigan. Jayden balked. As a family, the Orrs began fruitless weekend house-hunting forays. Nicole envisioned a home with high ceilings, big windows and a clear view of Lake Michigan. Andrew, after 11 years as a haberdasher with Tom James, wanted to move back into mission work. Andrew, 42, and Nicole, 40, met during a summer-long U.S. mission tour nearly 20 years ago. He hails from Kingston, Ontario and still has a scant Canadian accent. Nicole De Zeeuw Orr grew up in Sioux Falls, South Dakota. In suburban Columbus, they had a life with great friends and a warm worship community at Radiant Life Church. The call to Holland seemed strong, but it wasn’t easy. Andrew’s job search was going nowhere. With a deadline to leave their home, the Orrs couldn’t find a place in Holland. On Good Friday, their Realtor invited them to see a home not yet listed. The next day, the family drove to see the house, which seemed right and wrong: in Holland’s downtown area, older, unrenovated and at least five miles from the lake. Jayden, a voracious reader, suddenly couldn’t wait to move; Herrick District Library was just a few doors away. She leaned back on the couch next to her husband, laughing at those doubts. Andrew commuted for months, until International Aid hired him as the agency’s director of advancement. His new job started Sept. 4. International Aid sends help to 67 countries, including medical supplies to Sierra Leone, for the Ebola crisis. The Orrs have a growing circle of friends, a church home at Engedi and each one is genuinely happy. Nicole is even discovering her Dutch roots. The boys clomp around the house in a pair of adult-sized wooden shoes. Local organizations are stirring up a whirlwind of aid for victims of Typhoon Haiyan, the vicious storm that killed an estimated 10,000 people in the Philippines on Friday. Brian Anderson, president and CEO of International Aid in Spring Lake Township, said his Christian relief agency is collecting monetary donations at this time to help the victims of one of the worst storms in history. Instead of collecting individual items, Anderson said International Aid will use the donated money to ship pallets of hygiene and health care items to the Philippines, which will speed up the process of getting the goods to the affected areas. “We’re able to get more items there more rapidly with this approach,” Anderson said. Anderson said he hopes to collect $50,000, which will purchase 320 pallets of relief supplies. Those will fill eight 40-foot-long shipping containers that he hopes to deliver by the end of the week. Anderson said he watched the news late last week and over the weekend and was shocked at the devastation – nearly 10 million people are affected by the storm, which has been dubbed the most powerful in history. Nearly 650,000 people have been displaced. Anderson said most International Aid donations come from residents and businesses. Last year, the organization donated $87 million worth of relief supplies to 85 countries. Jay Davis, Captain of the Salvation Army of Grand Haven, said his international organization is already on the scene, although he has not had direct contact with any of the volunteers. International Aid CEO Brian Anderson said he’s confident area residents will rise to the request and donate personal items for the families that endured the violent storm. Priority items needed for the relief effort include soap, shampoo, toothbrushes, toothpaste, diapers, hand sanitizer, wash cloths, hand towels, wet wipes, disposable razors and similar items. All items must be new. The Christian relief organization has already contributed $84 million of assistance to 79 countries in the past 10 months, according to Anderson. In 2012, International Aid hit a record in generosity, shipping $160 million worth of relief items. “We’re very grateful for the people here in West Michigan who are always very giving and who do step up in these situations,” Anderson said. Donations may be dropped off at the International Aid warehouse between 8 a.m. and 5 p.m. Monday through Friday. To make a monetary donation, visit internationalaid.org and click on the “donate now” icon. Anderson is also asking area residents to keep the people of Oklahoma in their prayers. “We have been blessed in so many ways, both personally and as an organization, that it’s in times like this that we are able to bless others,” he said. The 40-foot cross, which sat atop the former Christ Community Church at 225 E. Exchange St., was removed when the church’s leaders changed the congregation’s name to C3 Exchange and said they wanted to become an inclusive spiritual community not focused solely on Christian beliefs. When the cross was removed amid public controversy on June 22, 2010, International Aid leaders asked C3 officials if they would donate the steel-crafted structure to the locally based Christian relief organization. International Aid officials had planned to erect the cross at their headquarters at 17011 Hickory St., but Spring Lake Township zoning and height restrictions nixed that idea. Due to budget and mortgage troubles, the C3 congregation moved its worship services to the Grand Haven Community Center in the fall of 2011 and put the Spring Lake building up for sale. After a deal to sell it to the Catholic Diocese of Grand Rapids fell through, Harvest Bible Church purchased the property in May 2012. After being vacant for more than a year, the building is undergoing massive renovations and should be open for its first worship service in late March.